Hans Jürgen Eysenck, PhD, DSc was a German-born English psychologist who spent his professional career in Great Britain. He is best remembered for his work on intelligence and personality, although he worked in a wide range of areas within psychology. At the time of his death, Eysenck was the living psychologist most frequently cited in the peer-reviewed scientific journal literature. The World Values Survey (WVS), a global research project, explores people's values and beliefs, how they change over time and what social and political impact they have. Since 1981 a worldwide network of social scientists have conducted representative national surveys as part of WVS in almost 100 countries. 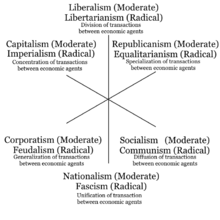 The Nolan Chart is a political spectrum diagram created by American libertarian activist David Nolan in 1969. The chart charts political views along two axes, representing economic freedom and personal freedom. It expands political view analysis beyond the traditional one-dimensional left–right/progressive-conservative divide, in order to position libertarianism as outside the traditional spectrum. The x-axis, "Attitude toward the State", refers to a political philosophy's attitude toward the state and centralized government. The farthest right is "state worship" and the farthest left represents the state as the "ultimate evil", preferring individual freedom. The y-axis, "Attitude toward planned social progress", refers to the extent which a political philosophy is compatible with the idea that social problems can be solved by the use of reason. The top indicates complete confidence in planned social progress and the bottom represents skepticism of such methods, often considering them as naively utopian. Those at the top of the axis would tend to discard a traditional custom if they do not understand what purpose it serves, while those at the bottom would tend to keep the custom. Ronald F. Inglehart is a political scientist and professor emeritus at the University of Michigan. He is director of the World Values Survey, a global network of social scientists who have carried out representative national surveys of the publics of over 80 societies on all six inhabited continents, containing 90 percent of the world's population. The first wave of surveys for this project was carried out in 1981 and the latest wave was completed in 2014. Since 2010 Inglehart has also been co-director of the Laboratory for Comparative Social Research at the National Research University - Higher School of Economics in Moscow and St Petersburg. This laboratory has carried out surveys in Russia and eight ex-Soviet countries and is training PhD-level students in quantitative cross-national research methods. The Authoritarian Personality is a 1950 sociology book by Theodor W. Adorno, Else Frenkel-Brunswik, Daniel Levinson, and Nevitt Sanford, researchers working at the University of California, Berkeley, during and shortly after World War II. NOMINATE is a multidimensional scaling application developed by political scientists Keith T. Poole and Howard Rosenthal in the early 1980s to analyze preferential and choice data, such as legislative roll-call voting behavior. As computing capabilities grew, Poole and Rosenthal developed multiple iterations of their NOMINATE procedure: the original D-NOMINATE method, W-NOMINATE, and most recently DW-NOMINATE. In 2009, Poole and Rosenthal were named the first recipients of the Society for Political Methodology's Best Statistical Software Award for their development of NOMINATE, a recognition conferred to "individual(s) for developing statistical software that makes a significant research contribution". In 2016, Keith T. Poole was awarded the Society for Political Methodology's Career Achievement Award. The citation for this award reads, in part, "One can say perfectly correctly, and without any hyperbole: the modern study of the U.S. Congress would be simply unthinkable without NOMINATE legislative roll call voting scores. NOMINATE has produced data that entire bodies of our discipline—and many in the press—have relied on to understand the U.S. Congress."